I am incredibly tactile. If I see a beautiful object, I want to touch it. To run my fingertips over it, search for a scent, close my eyes and enjoy the texture over my palms. Doesn’t work real well in museum situations, but books, textiles, fibers? Plants and wood, leaves and flowers. It’s all the same to me. I want to touch. To breathe in the scents. To run my eyes over beauty and feel it in my soul. Touch. And to touch Stitch and Structure by Jean Draper is sheer pleasure to touch. I removed it from its packaging and was immediately surprised by just how tactile the cover is. Soft, with a definite velvety feel, as if I were touching a newborn kitten. The format is large, allowing me to rub my palms over the cover, my fingertips loving the softness. The beauty of the cover on a visual scale is gorgeous. Textured textile, cords and wraps, spread out in a luscious view, reminiscent of a landscape of mountains and valleys seen from above – and the eyes of the earth along the top, both clever and surprising. Then, opening the book is yet another joy. Smooth, supple paper, cool to the touch. Rich, vibrant colour, brilliant black line drawings, the artwork leaps from the page, starting that little flutter of the heart that indicates that you have in your hand something truly gorgeous. And then, the art itself. These are unconventional structures: linear and curved, odd and unusual, some radiantly colorful, some reminiscent of earth, wood and stone and the swirl of water, the nest of a bird, the striations of a cave wall. Beauty. Structure. Form. Light and airy, or dense and convoluted, each item on the pages carries a sense of the soul of the earth. 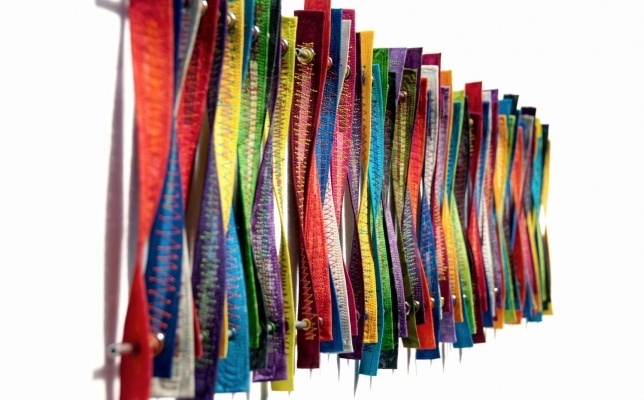 Draper’s work is the epitome of organic textiles. 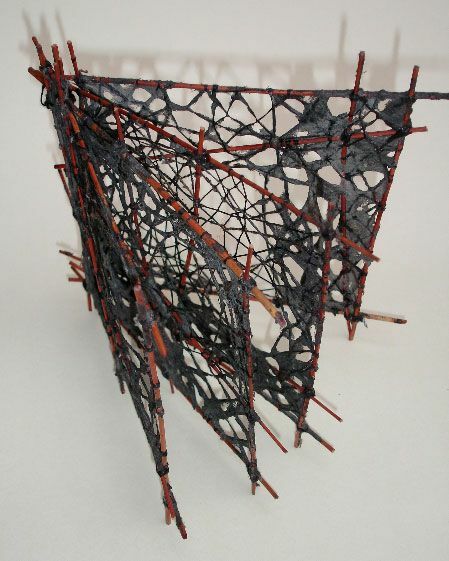 You learn her methods, whether it be drawing with a purpose, photographing natures lines and edges to constructing with threads, mounting threads in apparent thin air – her methods are beautifully designed, her art flawlessly flawed, making each piece a mix of odd, unique, and stunningly unusual in the best of ways. I am thrilled with the book, can you tell? I won Stitch and Structure from Reader’s Desk (ijustread.it) in their Read Whatcha Like Giveaway, and I can’t say just how pleased I am. Thanks, Reader’s Desk, for allowing me to choose this book for my prize! Joy and beauty. Two things we miss most in this hurry-hurry world of ours. The sound of wind through the trees. The sight of a field of flowers. The scent, and taste, of chocolate chip cookies straight out of the oven. Joy. I felt a bit of that joy when I received Daria Song’s “The Time Garden.” Printed in a large format on beautiful paper, the cover pictures an ancient tree, dropping copper and gold blooms through the sky. The shimmer immediately caught my eye and made me smile. Flipping through the pages, I immediately thought of the excesses of the Victorian times – pattern and design just this side of overwhelming, and yet balanced and flowing in line. And there is a rather sneaky Steampunk Vibe as well – clocks, gears and engines scattered about like secret whispers in the wind. Artful references to opera (Ouvre Ton Coeur by Georges Bizet), a trip to the Salle du rêve (the dream room). The wisdom of the owl, juxtaposed with the transience of the Sakura, the Japanese Cherry Blossom. The movement and pure merriment of the Ghirardelli Cable Car, the Pier 39 Carousel. And when is the last time you browsed an antiquarian book store? How I miss Borderlands Science Fiction Bookstore in San Francisco . . . how I miss San Francisco! This ‘coloring book’ is so much more than that. As an adult, I love colour, and this gorgeous format, the story of a little girl and her miraculous journey, is so amazing. Drawn in meticulous detail, it is such a joy to flip through, searching for the tiny messages and beautiful storyline. I haven’t started playing with it yet, but it is very high quality paper, and I think I will try it with coloured inks? The frontispiece will be the perfect place to try out colour before I begin, but for now just turning pages is relaxing. I received this book from Penguin books and Bloggingforbooks.com in exchange for a realistic review. All thoughts are my own, though, and I really do find it to be amazing! Reviews coming tonight, but it has been such rainy, gray, thunder/lightning/rain-rain-rainy weather, I have been blue. But, my favorite modern painter, Diane Millsap, sent out a photo of her newest work and I couldn’t resist sharing it with you. You can look at all Diane’s New Orleans artwork at Art.com. 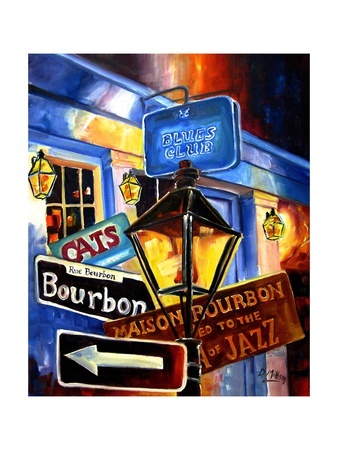 by clicking Signs of Bourbon Street to the left to go to Art.com for All Diane’s works. Or click her logo at right to c heck out her private site and view her art and her commentary on being a New Orleans Artist. Until then, I am going to put on some New Orleans Jazz and pull my head together to get some work done. Painting from the site of the Berkley High School New Orleans Jazz Festival. Click photo to go to site. There is often great delicacy in beauty. Tiny stokes of paint, gossamer fabrics floating on the breeze. Tiny stitches on fine cloth. “The Embroidered Garden” exhibits this sort of delicacy. Tiny, fine stitches, depicting flowers, butterflies and bees, fragile blooms which seem to float upon cloth, as if blowing in the breeze. 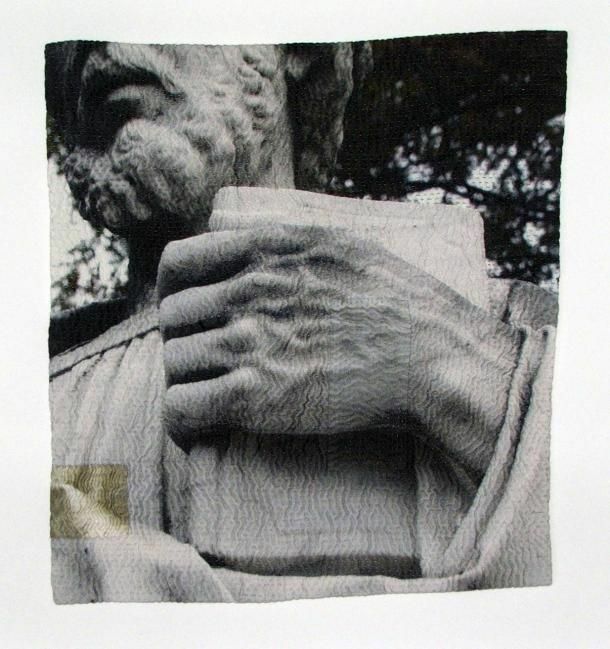 Embroidery is, literally, an ancient art form. From the ecclesiastical to the trim on luxurious smalls, embroidery has waxed and waned throughout history. Once a requirement for every young ladies training, these days it is rarely seen outside quality couture shops and Victoria’s Secret. It is nice to see such gorgeous handwork paid attention to once more. Aoki has brought back the beauty and elegance of a craft it would be ashamed to lose to the technical world we live in. I once did embroidery – the tiny stitches calming, repetition and the growth of beautiful handwork soothing to the soul. Anyone with an interest in beauty and gorgeous hand work should find great pleasure in this book. 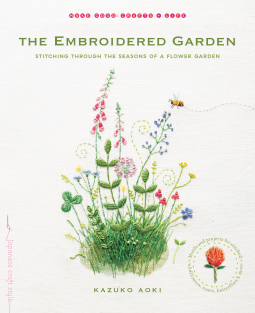 I received The Embroidered Garden from the publisher in exchange for a realistic review. All thoughts are my own. Whimsical, beautiful embroidery motifs created by an avid gardener—stitch roses, bees, or whole garden scenes. Kazuko Aoki has a unique talent for translating the beauty of the garden with needle and thread. By offering forty motifs, Aoki invites us to explore her gardens through embroidery. The forty motifs explore the roses and wildflowers that appear season to season, as well as the bees and butterflies that enjoy their nectar. The designs here are exquisite, detailed, and artfully rendered. Beyond the motifs themselves, Aoki also presents projects that feature the embroidery: brooches, notebook covers, pin cushions, and pouches. For those new to embroidery, detailed how-to illustrations are included. Quilts have existed, literally, throughout history. While they are made from fabric, and therefore examples are hard to find before Roman times, scraps from that period have been found in digs. The Middle Ages hold many examples of quilted fabrics being used under the metal armor used by knights to shield their bodies from sharp edges and protect them from blows against the metal. 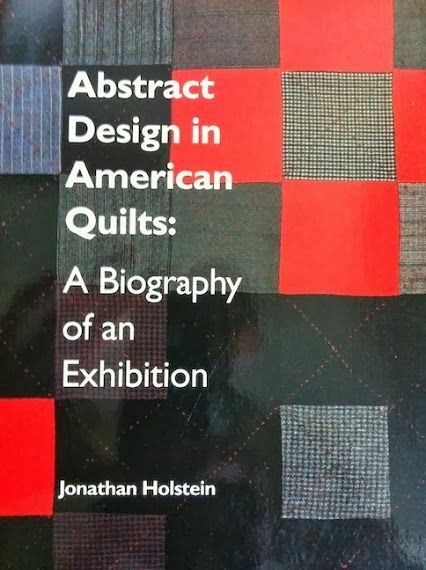 I remember my first quilt show, at the local county fair. I worked for hours on end to stitch a Bargello quilt in all shades of reds. I very carefully chose all my fabrics, carefully matching thread colours to blend, not only to my top but to the floral background I oh-so-very-carefully chose to go with the top. I was soooo proud of that quilt! Imagine my dismay when the judge, an elderly woman with a tight, lemon-pucker face, said, “You know, you could have won, if you hand just used the proper thread. Quilts are always quilted with WHITE thread!” As I looked at my much loved quilt, I gave up in tears. White thread?!?! All you would see would be the thread!! It would totally take away from my quilt! I gave my quilt away, and didn’t quilt again for years. The stunning asymmetry and colour use of one of the Gee’s Bend Quilts. All the quilts are made of ‘found’ or cast off fabrics, worn clothing, feed sacks and sometimes, just sometimes, purchased fabrics. 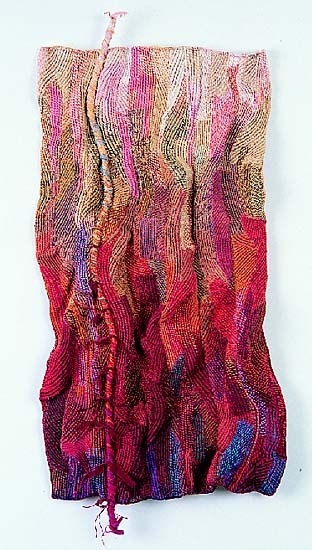 artists work in fiber, certainly, but how they handle their materials is wide-ranging and exciting. 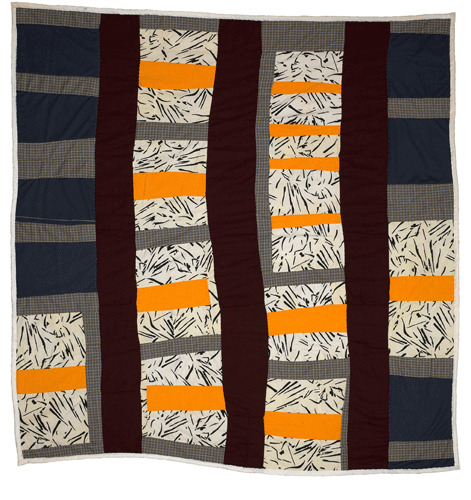 All sorts of fibers are used – but how it is handled is deeply based in the idea of quilt as art. From new ways to utilize symmetry and repetition to new forms of dying, painting, uses of three dimensional forms and uses of non-fiber materials such as metals and jewels, the old has become new again, while still hearkening back to its historical roots, philosophy and culture. 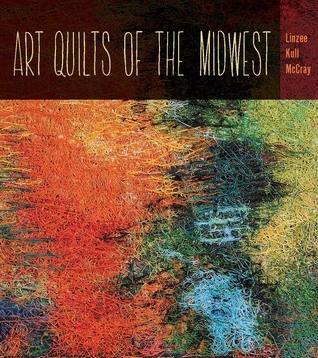 If you are interested in art as a whole, or in quilts in particular, this is a beautiful book to add to your collection, whether as a coffee table book to browse at your leisure over a cup of tea, a fount of ideas for your own quilt, or a paean to beauty, this is a gorgeous book to add to your library. Linzee Kull McCray grew up in California and resides in Iowa. After nearly thirteen years as a writer and editor for the University of Iowa, she is a fulltime freelance writer with a focus on textiles, art, and craft. She is a contributing editor at Stitch magazine and her work appears in Etsy’s blog, UPPERCASE, American Patchwork and Quilting, Quilt Country, Quilt Sampler, Modern Patchwork, O magazine, and numerous other print and online publications. Ah, fairy tales. We all loved them as a child, and now, as children at heart, who doesn’t love them still? 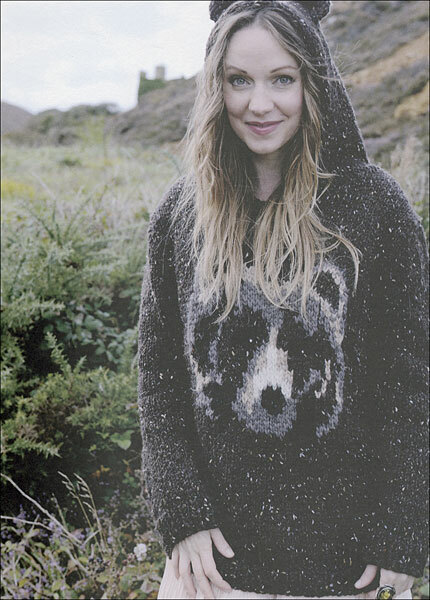 Stephanie at Tiny Owl Knits harkens back to fairy tales with her book Woodland Knits – and any lover of the lighthearted and fairy-like is sure to love this collection of fairytale knits. Why, you can even learn to make your own fairy wings! There are 21 knitted beauties in this collection, and there is sure to be something here – or several somethings – for you to love, and which fit your knitting skill set! I am making O My Bear! right now – (no, I won’t knit the ears, but the rest of it? You bet! I am using Plymouth Yarn’s Encore Tweed Worsted doubled, so it is working up quickly. The bear will be done in worsted weight as well, except for the brown/grey part of the bear, which I am using a “wooly” yarn on to give it texture. Pics will show up when I am done! The instructions are well written, the patterns are darling, and if you need help, all you have to do is email Stephanie and she gets back to you ‘quick like a bunny!’ If you like to knit, this is a great, fun book, full of everything from the simple to the more fiddly – but realistically, everything is easy enough that, with a bit of thought there is nothing here you can’t make! Yes. I admit it. I am addicted to color. Color everywhere – in my home, in my arts, in my knitting. I am a total and complete addict. And you know what? I have NO intention to 12-step it away! And then, of course, there is design. Fibers, textures, unusual lines. All these things are important to me. And there a boat-ton of patterns I have in my stash that make full use of all of these lovelies. But you know what? I would have to live to be 500 to make all these things – and sometimes I can’t even get the time to make one. Sigh. With that as the case, I am thrilled to have More Last-Minute Knitted Gifts. Sometimes you need small items for friends, birthday gifts, that sort of thing. And sometimes, when you are really feeling hammered by life, when nothing ever seems to be done and complete, well, being able to finish just one thing can sooth and calm the mind and make life better. This is the perfect book to reach that goal. From the ultra-simple, like the Reusable Hot Coffee-Cup Sleeve – it only takes about an hour to finish – to the Bright Stripes Blanket – 1800 yards of beautiful bright yarn and a longer finish time, but easy-peasy garter stitch – well, I love this little book! The instructions are clear and Joelle gives ideas for different fibers and colours to make the same item for different people fit each person’s personal style. For me, the Toe-Up Socks pattern is going to be my go-to pattern for socks (I run around with just socks on all the time, holes are a given… ). The book also includes excellent instructions for “how-tos,” everything from binding on to binding off with Kitchner Stitch. Highly recommended for everyone from the beginner to the advanced knitter who is looking for simple projects that bring smiles! When I picked up Handbag Workshop I was honestly expecting something different. The other bag books I have read or purchased are honestly more ‘crafty’. I love quilting, so making quilted bags is sort of my thing – though I have several knitted and felted bags in my stash. This? This is something much different. And I mean that in an “OMG, this is INCREDIBLE! Sort of way. The bags in this book are, in a word, stunning. That doesn’t mean that my quilted bags aren’t – but these are bags that you might pick up in a quaint little shop in Italy or Paris. They are made of leather and/or high quality tapestry, and beautiful fittings. Anna Mazur’s book is somewhat of a work of art itself. She starts you out slowly, teaching bag forms, such as the 1950s Princess Grace Kelly trapezoid-shaped tote designed by Hermes and now known as the Kelly Bag. Beginner bags, intermediate and advanced level bags, from simple pouch style zippered bags to a Shaped Cube Drawstring Bucket Bag, each of the bags included in the book are small works of art. Works of art which, of course, require the right tools and materials. Tools and materials? 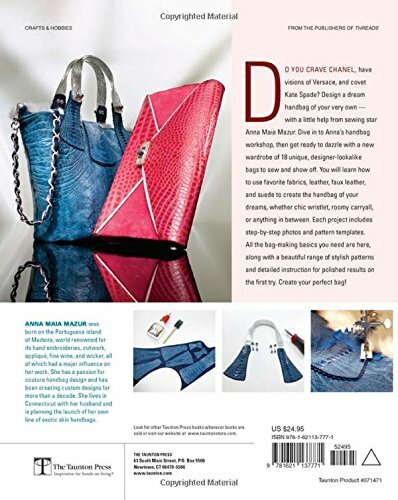 Anna Mazur leads you through everything you need to create these bags, based upon the needs of each bag’s materials. She is extremely clear in all of her instructions, from materials to neat little tricks to make your work easier to complete in order to create a stunning bag. With all of the positives in the book, my favorite part? The photos. Anna has taken gorgeous step-by-step photos which lead you through the making of each bag without questioning whether or not I am doing something wrong. The tools list is broken out for each bag so that you don’t have to purchase any materials you don’t need in order to complete the bag you are working on. Overall? If you are looking for simplistic bag making, sans zippers and other fittings, I can recommend other books which will meet your needs perfectly. If you want to create a bag (or let’s face it – multiple bags!) that will astound everyone who sees it, and make all of your friends achingly jealous, you really must buy a copy of this book. It is Gorgeous, well written, beautifully photographed, easy to follow, and one of those books that will take pride of place on your art bookshelf. I received this book from the publisher in return for a realistic review. All thoughts are my own. 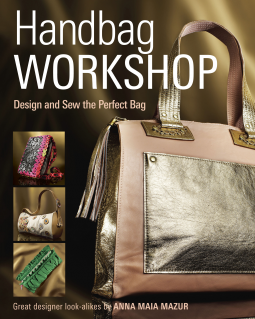 If you are interested in creating bags of true beauty and elegant design, you can’t go wrong with Anna Mazur’s Handbag Workshop.